There are tons of keyboards shortcuts for Chromebooks. I could flood this post with lots of them and call it 50 Chromebook Shortcuts very easily. However, I think that would make this post pretty useless. You can go to Google’s site and see all of the different shortcuts. The problem is we aren’t going to remember 50 shortcuts by reading them. We have to use them and they have to be useful for us on consistent basis. Rather than give you 50+ shortcuts you won’t remember, I’m going to tell you the top 21 Chrome keyboard shortcuts that will save you time and make using your Chromebook easier. Many of these will work for Chrome on Windows too. Let’s cover these three staples first. They are probably some of the best know keyboard shortcuts and they are pretty much work on any device. Ctrl + V will paste whatever you have copied or cut. We all make mistakes. Maybe you deleted contents of a cell in a Google Sheet. Maybe you accidentally deleted an entire paragraph from a Google Doc. Ctrl + Z will undo the last thing you did. In many cases you can undo the last several things you did by pressing Ctrl + Z multiple times. Want to undo your undo? Ctrl + Shift + Z will put back the last thing you undid. Again, you can typically press it multiple times. Ctrl + Y does the same thing. For years years most keyboards have had a Backspace key and a Delete key. The Backspace key deletes things to the left of the cursor. The Delete key deletes thing to the right of the cursor. This shortcut isn’t limited to just Chromebooks. It works on Chrome for Windows too. I will often copy text from a website to share in an email or other document. However, I typically do not want to use the same formatting and font. Whether you are a teacher or student you should never walk away from your Chromebook without signing out or locking your Chromebook. Locking the Chromebook screen does not close anything. It’s simply like putting a padlock on it so that no one can change your files or delete something while you are away. When you reenter you password, everything you had opened on the screen will still be there waiting for you. It is often helpful to have two websites side by side so you can see both of them at the same time. For example you might do Internet research in one Window while you type in a Google Doc on the other. Let’s say you have two tabs open in Chrome and you want to see both side by side. First, click and hold on one of the tabs and drag it down so it moves to its own Chrome window. Did you know you could do that? Second we are going to use the bracket keys (next to the P key) to move our windows. Click on one window and then press Alt + [. This will move the window to the the left side of the screen. Click on the second window and then press Alt + ]. This will move the window to the the right side of the screen. Now the two windows should be side by side. This works on a locked Chromebooks too. Another oldie, but goody is Alt + Tab. This keyboard shortcut will allow you to switch between windows and/or apps. Keep holding down Alt while repeatedly press Tab until the window/app you want to access is select. Then let go of the Alt key. Screenshots are extremely useful when trying to make directions, create a Google Slide presentation, or even a blog post. Ctrl + Switcher takes a screenshot of your Chromebook screen and saves it to your default location. Either your Downloads folder or Google Drive. Sometimes you don’t need a full screenshot, but rather just part. Ctrl + Shift + Switcher Will charge your mouse pointer to a cross hair. Move the cross hair to one corner of the area you want to capture. Click the mouse or touch pad and move to the opposite corner you want to capture. When the have the area selected, release the mouse or touch pad. The section will automatically be saved to your default save location. Not all web pages are created equal. For example some sites use larger fonts than others. Occasionally you may want to zoom in or out on a particular site. To do this you can repeatedly press Ctrl + + to zoom in or Ctrl + – to zoom out. This only affects the current Chrome tab you are looking at. Maybe its not just one website you need to make bigger, but rather everything on your Chromebook. You can change the scaling on your Chromebook by pressing Ctrl + Shift + + to increase or Ctrl + Shift + – to decrease. This setting effects all Chromebook users, but also can be changed by all Chromebook users. You can reset the screen scale to default by pressing Ctrl + Shift + . Have you ever visited a web page on day and wanted to visit it again the next but couldn’t remember the site? You could of bookmarked it using another keyboard shortcut, but you forgot. Thankfully, your Chrome Browser remembers. You can bring up your browsing history by pressing Ctrl + H. It will list the web addresses you have visiting recently by date and time. It will even show you sites you have visiting on other devices you are signed into Chrome such as mobile devices. Even if you don’t remember of of these shortcuts or you are looking for others, Chrome OS has a handy way of showing them on a Chromebook. You can press Ctrl + Alt + ? to open the Keyboard Shortcuts help window. Previous to Chrome OS version 66, this keyboard shortcut showed you a keyboard overlay. The overlay was better at showing you key placement, but I think the fact that this new keyboard shortcuts help window is searchable makes it a very useful learning tool. I believe the Chromebook shortcuts I mentioned are some of the most common and most useful shortcuts students and teachers will want to use. However, I do have three more honorable mentions that can occasionally be useful. Some people think not having a caps lock button on a Chromebook is a big deal. NO ONE LIKES SHOUTING so we should not be typing in all caps. If you need to capitalize a letter just hold the Shift key when pressing the letter. I can thin of a few times that turning caps lock on may be useful and it is possible on a Chromebook. To turn on caps lock press Alt + Search. A popup will show up in the bottom-right corner of the screen letting you know that CAPS LOCK is on. You will also see this icon. To turn caps lock off, press Alt + Search again. Chrome OS has a file manager similar to Window’s Explorer. From it you can access files in your Google Drive and files saved locally in your Downloads folder. You can save all of the tabs the you have open into a Bookmarks folder Ctrl + Shift + D. After you press the shortcut you will be prompted to enter a folder name. This can be useful for teacher as a training and students doing research. As I mentioned, the easiest way to learn these keyboard shortcuts is to use them. So try implementing the into normal routine. Hope you found some of them helpful. 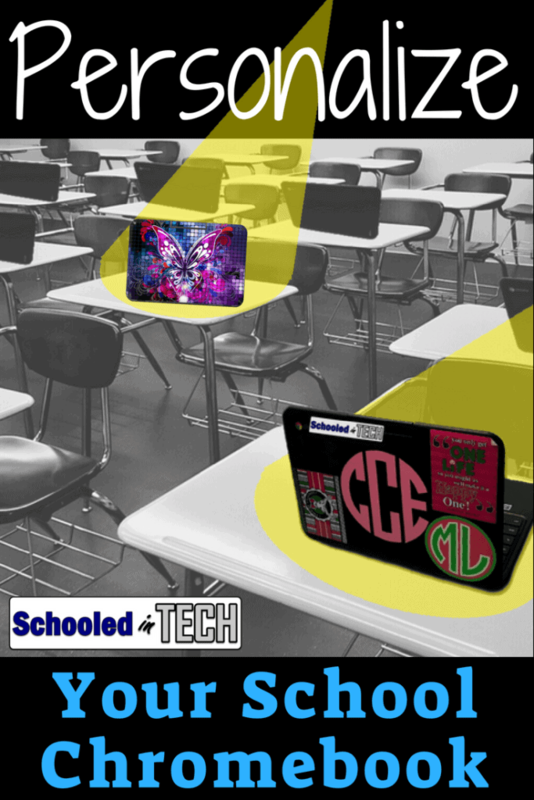 Add Your Own Style & Chromebook Accessories!